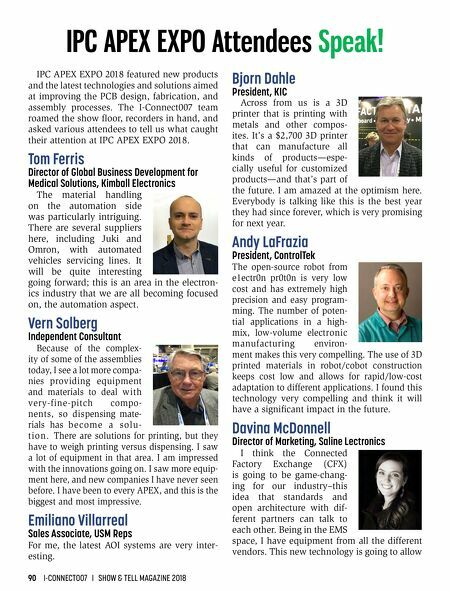 90 I-CONNECT007 I SHOW & TELL MAGAZINE 2018 IPC APEX EXPO 2018 featured new products and the latest technologies and solutions aimed at improving the PCB design, fabrication, and assembly processes. 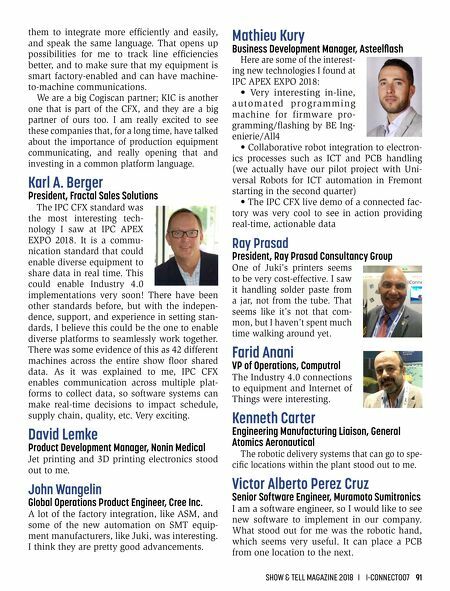 The I-Connect007 team roamed the show floor, recorders in hand, and asked various attendees to tell us what caught their attention at IPC APEX EXPO 2018. Tom Ferris Director of Global Business Development for Medical Solutions, Kimball Electronics The material handling on the automation side was particularly intriguing. There are several suppliers here, including Juki and Omron, with automated vehicles servicing lines. It will be quite interesting going forward; this is an area in the electron - ics industry that we are all becoming focused on, the automation aspect. Vern Solberg Independent Consultant Because of the complex- ity of some of the assemblies today, I see a lot more compa- nies providing equipment and materials to deal with very-fine-pitch compo- nents, so dispensing mate- rials has become a solu- tion. There are solutions for printing, but they have to weigh printing versus dispensing. I saw a lot of equipment in that area. I am impressed with the innovations going on. I saw more equip- ment here, and new companies I have never seen before. I have been to every APEX, and this is the biggest and most impressive. Emiliano Villarreal Sales Associate, USM Reps For me, the latest AOI systems are very inter- esting. Bjorn Dahle President, KIC Across from us is a 3D printer that is printing with metals and other compos- ites. It's a $2,700 3D printer that can manufacture all kinds of products—espe- cially useful for customized products—and that's part of the future. I am amazed at the optimism here. Everybody is talking like this is the best year they had since forever, which is very promising for next year. Andy LaFrazia President, ControlTek The open-source robot from e1ectr0n pr0t0n is very low cost and has extremely high precision and easy program - ming. The number of poten- tial applications in a high- mix, low-volume electronic manufacturing environ- ment makes this very compelling. The use of 3D printed materials in robot/cobot construction keeps cost low and allows for rapid/low-cost adaptation to different applications. I found this technology very compelling and think it will have a significant impact in the future. Davina McDonnell Director of Marketing, Saline Lectronics I think the Connected Factory Exchange (CFX) is going to be game-chang- ing for our industry–this idea that standards and open architecture with dif- ferent partners can talk to each other. Being in the EMS space, I have equipment from all the different vendors. This new technology is going to allow IPC APEX EXPO Attendees Speak!